Project obstacles and solutions: The Indiana Railroad Company needed to update its aging locomotive maintenance facility. The project consisted of two buildings: a maintenance building which covers 12,000 square feet and a warehouse which covers 11,100 square feet. It includes a fuel canopy which covered 15,750 square feet. The project has a 20,000 gallon oil and wastewater capturing and filtering system, which separates the oil and pumps it into a holding tank. The new maintenance area was constructed with high ceilings and 30 five ton overhead cranes. It has the capacity to hold four locomotives at one time. The old facility housed only one locomotive. The new facility has been constructed with four jacks that are capable of lifting a locomotive off of its tracks for the inspection of its understructure. It also includes three deep pits for working under the trains and overhead walkways for the inspection of the top of the locomotives. The old pits had been only 28 inches deep and lifting the trains was not possible inside the building. Workers had to crawl into the pit to do work on the underside of the locomotive. Force Design had to give special consideration to precise areas of the maintenance structure. The concrete was designed for specific strength requirements throughout the structures. IMI QC/QA personnel worked with structural engineers at Force Design to test concrete strengths. All of the warehouse and office slabs on grade utilized a synthetic fiber in the concrete mix to minimize the impact of thermal and plastic shrinkage. The maintenance building floor and the pit areas were reinforced with imix XS steel fibers. The concrete surrounding the four jacks and the pit under the rails has a higher concentration of imix XS steel fibers in the concrete to help support the stress on supporting structure. For more information on imix XS steel fibers, click here. 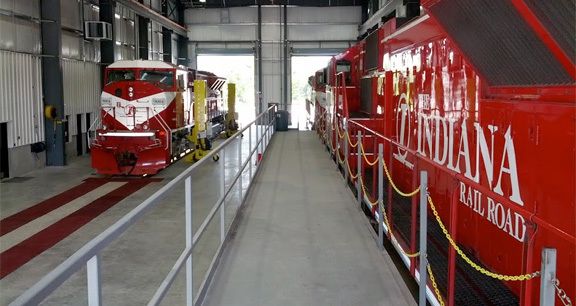 The new Locomotive Maintenance Facility opened for business in November 2013. This project was awarded a 2013 Excellence in Concrete Award from the IRMCA.